It’s been a personal goal to continue my on-going effort to improve overall jazz coverage, be it writing for the mainstream press, specialized and jazz radio audiences. 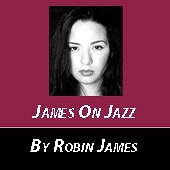 It’s been that way since day one, when I wrote my first column titled “My Jazz Journey” 15 years ago this month. What I’ve discovered along the way is that I take writing about jazz, the subject matter, the amazing tradition and history, seriously, for both personal and professional reasons. I guess you could say jazz is in my DNA. Writing about the news as it relates to the past, present, and future is hard. But also on the surface, it can also be enjoyable and incredibly rewarding at the same time. Currently, I enjoy writing about all different kinds of music. In particular, I’ve come to understand that diversity is at the core of jazz music and it ought to be reflected more in the writing offered to the public. Some voices are there, on the beat, constantly, while others are given limited exposure. We’re making progress on that front, however we have a long, long way to go. I believe as a music writer, it’s important to take responsibility for providing meaningful and insightful broad-ranging coverage of the jazz community at large. After all, jazz is America’s national treasure and a gift to the world. And it’s been said that jazz is the ultimate expression of individual freedom. We owe it to ourselves to get better and more deeply acquainted with this music and pass that knowledge on to the next generation. As a woman and person with family from Texas, Wisconsin and Alabama, and I’d like to think that my writing offers a unique view on the music. I am grateful for the opportunities afforded me thus far. I’m still learning and invite you to continue with me on this journey. Along the way, one highlight was receiving a music writing scholarship, which allowed me to go to the first-ever 2005 National Critics Conference held in Los Angeles. Fast- forward 10 years to 2015 — I’m still here. Without the wisdom, guidance, attention, and love of numerous people — too numerous to mention here — I wouldn’t be where I am now. Thank you; you know who you are. Since attending the National Association of Black Journalist (NABJ) held in August in Minneapolis, it occurred to me that after writing about jazz on a regular basis, it’s a lot like writing about race relations and social issues of the day — and dealing with those social issues at the same time. I see more clearly the parallels that exist between jazz, race relations, and social issues. If one looks closely at the origins and history of jazz, it’s not hard to tell. Blacks, Whites, and Latinos, among other ethic backgrounds, have been sharing the bandstands together and making music for decades — and so here’s an example of how everyone can get along if they truly want to. Jazz music has always included and reflected various cultures and the times in which we live. We’re continuing to refine it and mold it. Perhaps, told best from the vantage point of those on the front lines of this music, and those who have made considerable historic impact. We all know them on a first name basis, Louis, Ella, Dizzy, Monk, Miles, Nina, and the list goes on and on. It’s well-known and has been quoted by many popular jazz luminaries, that jazz is about democracy in action. Surely, its about give and take, just like anything else in life. Even more so in music. I choose to look beyond the current and long-standing battles and valid/non-valid debates over the music, and instead focus on how we can collaborate, create more harmony, and sustaining growth. Ultimately, while enjoying the music — any kind of music — one also wants people to eat, drink, dance, and have a good time. What could be a better time than that? Well, if the band isn’t getting along, there’s no swing. And you know what Duke Ellington says about that. It’s true, some writers, artists, and musicians are better at reaching an audience and creating that special feeling and bonding experience that happens as the music happens. I think we’re all constantly trying to get better as lovers of this music. And love is a prerequisite of this music. If that wasn’t the case, there would be no polls, no award shows, no big magazine cover stories year in and year out. In any case, that’s what history has taught me. There is visibly a current urgency and high-level of interest in learning and enjoying this music that we have come to know as jazz. People are even taking to Twitter and tweeting about attending their first jazz concert. Excitement is building for this music. On Tuesday, September 8, pianist and New Orleans native Jon Batiste and his Stay Human band join comedian/TV host Stephen Colbert as bandleader/music director of his The Late Show with Stephen Colbert. Colbert recently penned a piece for one of the mainstream women’s magazines professing his love for women and his hope that they will watch his program, as he plans to appeal to more of them. As for developing a better understanding and appreciation for this music, it’s a major opportunity for a musician from the world of jazz, such as Batiste, to have a television platform from which to present music on a regular basis — and great learning opportunity for the general public to learn more about the music, too. Next to saxophonist Branford Marsalis, I don’t recall another well-known and respected jazz musician with a similar opportunity to showcase their talents on Late Night television. Like Marsalis, Batiste has demonstrated that with his personal sound he’s able to communicate with power and clarity. That kind of thing moves people. And that’s probably why Batiste got the gig, right? Colbert is no stranger to jazz. The 50-something who grew up in Charleston, South Carolina, has invited jazz musicians on his past shows. For one, Batiste. Twice, I think. He has good taste. (See a clip of Jon Batiste and Stay Human via @ComedyCentral). To quote one of our elders and life-long jazz supporters, “When there are more people of color on the bandstand, than in the audience, there’s a problem.” The good news is that the musicians playing and excelling in the jazz genre are diverse. So, they are helping to attract a wider spectrum of people from various ethnic backgrounds. Speaking of maximum jazz exposure, I don’t want to leave out, St. Paul, my hometown. Dr. John recently performed as part of the 17th annual Twin Cities Jazz Festival at the new CHS Field in St. Paul. He was chosen as the first musical act to do so. I was there, I wrote about it, I tweeted about it. I experienced it first hand. The experience got me to thinking, besides the money, I’d like to know why so many artists (the really great ones) and musicians of all genres come back — and not for the reasons they tell writers in interviews before they come to town. No really, I’m most interested in what draws them to our audience base. Perhaps, the draw is that we’re passionate lovers and supporters of all music, and lots of other things: baseball, football, biking, hiking, and well, you name the sport. Sir Paul McCartney even rented a bike to ride around during one of his visits to Minneapolis. Now that we have a number of stadiums, maybe we’ll build more music venues. Or keep presenting local and national artists at stadiums, instead. Whatever the case may be, getting the chance to listen to good music in any setting is a blessing and a luxury — a luxury many people simply can’t afford, which is unfortunate and I don’t have to explain why. I’m proud to be from the Midwest, just as others are proud of where they come from. It is so nice to be able to write about jazz and music in general from the perspective of someone who is based here, but has traveled a bit, too. Returning to the Dakota this September is bassist Victor Wooten (Sept. 8 & 9) New Orleans trumpeter Christian Scott (Sept. 11), plus singers Jeffrey Osbourne (Sept. 29) and Lizz Wright (Sept. 22). I know Wright has been to the Dakota previously. Recently I learned of a new young singer named Andrea Day, and I’m looking forward to finding out more about her. So far, I’ve enjoyed listening to “Rise“ from her debut album, Cheers To The Fall (Warner Bros.). I’m also looking forward to welcoming Janet Jackson back to the bandstand. She just kicked off her Unbreakable Tour in Vancouver on Sunday, August 30. Jackson is scheduled to perform in support of her album, Unbreakable (due out in October) in Minneapolis on Sunday, November 1.